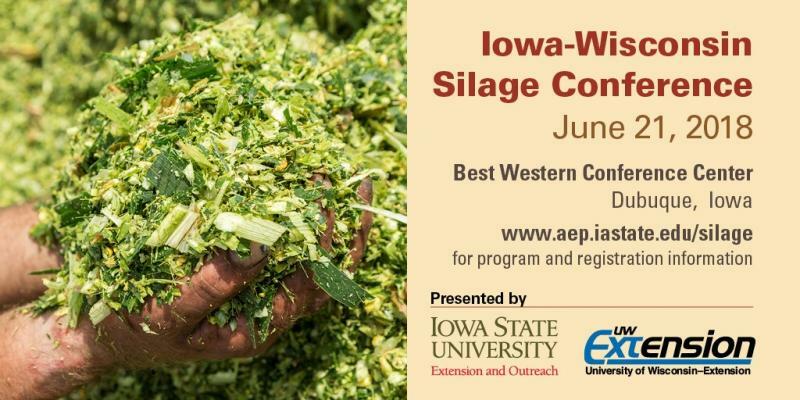 AMES, Iowa – Iowa State University Extension and Outreach will help host the Iowa-Wisconsin Silage Conference on June 21 in Dubuque. The conference will feature presentations from both academic and industry experts who will speak on a wide variety of topics related to growing and using quality silage. ISU Extension and Outreach specialists Hugo Ramirez, Denise Schwab and Garland Dahlke will present during the course of the day-long conference. Online registration is available for the conference. Cost for the event is $50 if registering prior to midnight on June 14, and $75 after that date. Registration includes lunch and refreshment breaks. The conference begins on June 21 with check-in and refreshments at 8:30 a.m., followed by the welcome at 9:30 a.m. It will take place at the Best Western Plus Dubuque Hotel and Conference Center (3100 Dodge Street, Dubuque). Group sessions will cover quality corn silage before, during and after harvest, characteristics of corn varieties for silage, molds and mycotoxins in silage and pricing corn silage. There will be concurrent sessions in the afternoon, with participants being able to choose between four distinct 30-minute conversations. The conference will conclude with presentations on machinery efficiency and corn silage safety before adjourning at 3:30 p.m.
For assistance with registration, receipts, cancellation or questions contact Program Services at 515-294-6429 or anr@iastate.edu. Northwest Iowa beef and dairy producers depend on quality corn silage to build profitable rations. To help them accomplish this, the Iowa Beef Center and Iowa Extension Dairy Team are hosting the NW IA Corn Silage Clinic on August 28 at the Northwest Iowa Research and Demonstration Farm in Sutherland. “The NW Iowa Corn Silage Clinic will feature top experts from the upper Midwest with the most current information on topics that affect corn silage and earlage quality and economics” notes ISU Extension Dairy Field Specialist Fred M. Hall. Presentations will begin promptly at 9 am and will break at 12 noon for lunch. The program will adjourn by 3:30. Each expert will be available to answer questions. Agronomic practices impacting corn silage digestion- Dr. Fred Owens, feedlot nutrition specialist. Silage and kernel processing equipment- Aaron Ostrander, John Deere silage specialist. Silage additives and inoculants- Dr. Scott Dennis, Pioneer. Evaluating corn silage and earlage: What’s typical, Dr. Dan Loy, ISU Beef Center director. Quality corn silage going in and coming out, Dr. Hugo Ramirez, ISU dairy specialist. Pricing corn silage, Dr. William Edwards, retired ISU ag economist. In addition, there will be two concurrent session featuring feeding corn products to the beef animal with Owens and feeding corn products to the dairy cow with Ramirez. Producers will also be able to walk through corn silage variety plots and talk with seed company technicians. “In addition, there is a trade show which will allow producers to compare equipment and products used in putting up quality silage,” says ISU Extension Beef Field Specialist Beth Doran. Registration is $25, with payment at the door. Pre-registration is required for the meal count and can be made by calling the Sioux County Extension office at 712.737.4230.